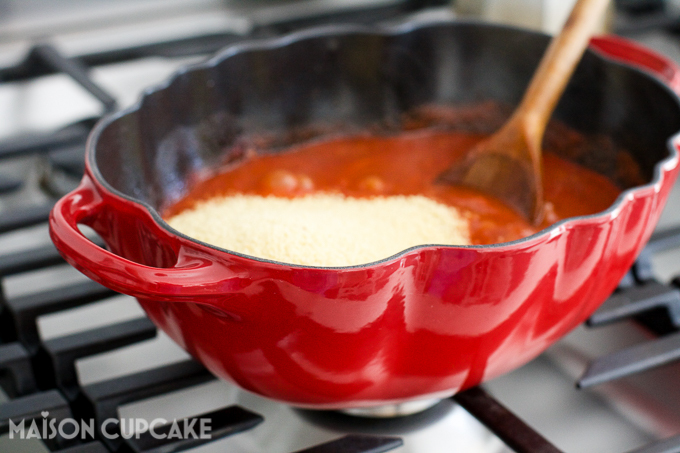 This red Staub cocotte makes the perfect serving dish for this easy tomato couscous and a great centrepiece for the table. Staub and Zwilling were not names I’d come across before so when I heard they were a new global kitchenware brand launching in the UK I was curious to learn more. The company invited me to a launch event in July and offered me this colourful tomato cocotte Dutch oven to try out. 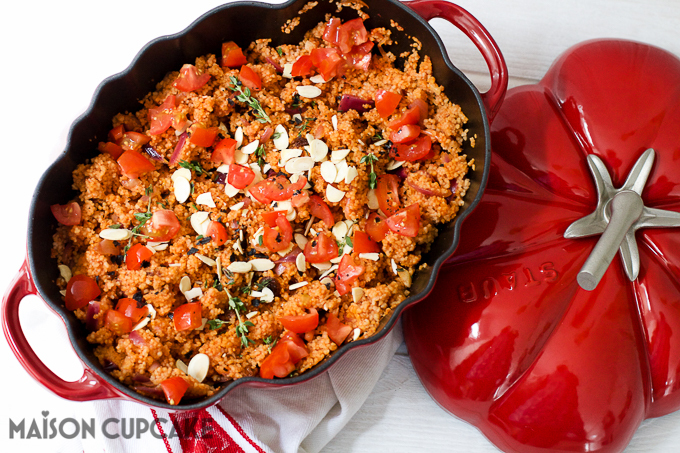 Being summer I was not craving the usual stews I might make in this type of casserole dish but its striking tomato design inspired me to make another couscous recipe after the popular garlic mushroom couscous last month. Staub do make more typical looking oval and round casserole dishes but faced with a choice I couldn’t resist this striking red tomato staub cocotte. Made from cast iron in Alsace, France, they also do a pumpkin version* in orange. It’s “three quarts” size which according to Google correlates to around 3.4 litres metric volume i.e. 6-8 portions. Being made from cast iron means you can cook efficiently on lower temperatures and the heat circulates evenly. When removed from the heat, the covered food will stay warm longer than in other dishes. Whilst covered in tough enamel with a limited lifetime guarantee, you will want to protect the exterior from scratches. On certain hobs you’ll need to lift rather than glide to avoid damaging the base. The Staub cocotte is compatible with heat sources such as induction or ceramics but you’ll need to let it cool down for 15 minutes before running under cold water. If storing with the lid upside down (to save space) put a pan protector (such as this type by Lakeland*) between the base and lid. This tomato couscous recipe has been made with a carton of tomato juice, the type you’d make Bloody Mary from but you could use 400g thin tomato sauce topped up to the same volume with water. Red onions are used here but may be substituted with shallots or ordinary onions. This is a versatile vegetarian dish to serve hot with tagines or stews but you can serve it cold with salad. If you added some pulses it would be substantial enough to enjoy as a main course in itself. If no one present is vegetarian, chicken or beef stock can be used instead. 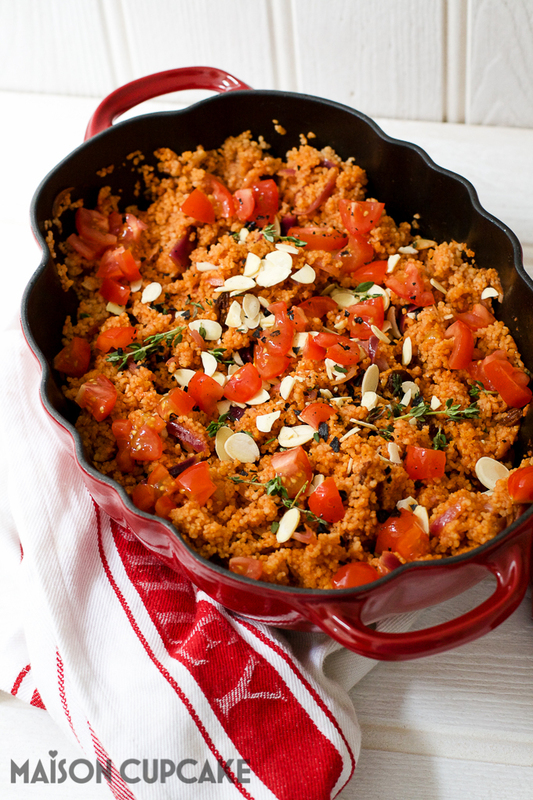 If you wish to freeze this couscous recipe, omit the fresh tomatoes, herbs and nuts until serving once defrosted. This dish will store in the fridge for 2-3 days so it’s great for leftovers, picnics or packed lunches in summer. Children seem very fond of couscous but might prefer it here minus the thyme and toasted almonds. Retailing at just under £200, this is an investment piece currently sold in the UK by upmarket kitchenware store Divertimenti. If you can’t get to Divertimenti (or prefer not to lug it home!) then Amazon are currently selling them for £210*. It was apparent at the launch that the brand were courting retailers from John Lewis to Harrods so it’s likely their products will pop up elsewhere soon. Zwilling’s core products are knives and saucepans. You can see a wide range of their products here on Amazon* – I particularly like this range of other red Staub cookware* including fondue sets, grill pans and roasting dishes. The red and white woven tea towel in this post was a recent sale purchase by Laura Ashley but you can find similar red and white linen tea towels on Amazon. 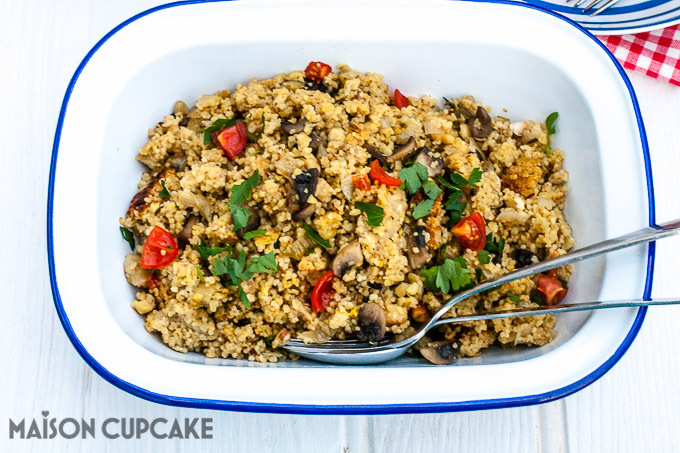 This easy tomato couscous recipe using the Staub cocotte (Dutch oven) can be made in around 20 minutes and perfect for main meals, cold with salad, picnics or packed lunches. Heat the rapeseed oil in the cocotte over a medium heat. 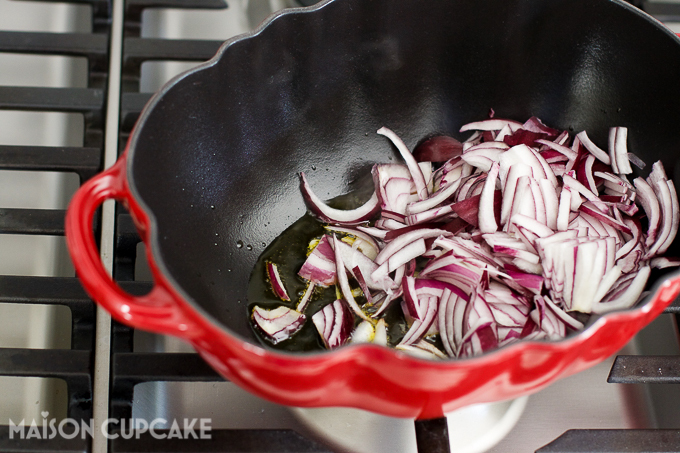 Gently fry the red onion for several minutes then add the garlic and fry for a couple of minutes more. When the onions and garlic are softened, stir in the tomato juice, vegetable stock cube and paprika and bring to a simmer. Add the water and return to a simmer. Add the couscous and stir thoroughly to ensure everything is evenly mixed. Turn off the heat and replace the cocotte lid. Leave the couscous to soak up the liquid for 10-15 minutes. Fluff the grains with a fork before serving. Scatter over the almonds, thyme and tomato to serve. *Affiliate links used. 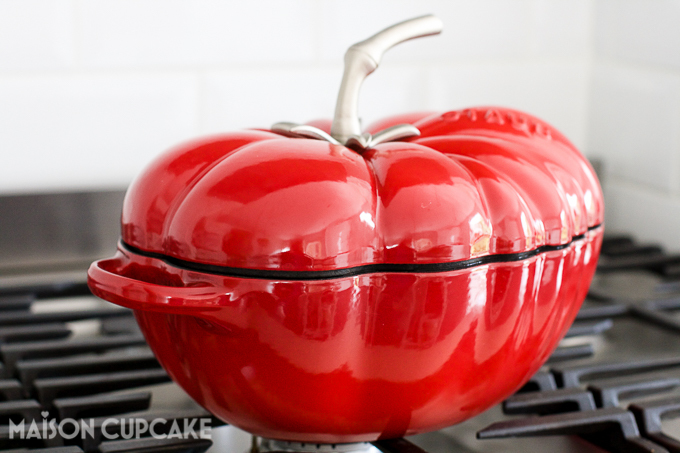 With thanks to Zwilling / Staub for gifting this tomato Staub cocotte. I absolutely love this dish, Sarah! Anything that looks like a fruit or vegetable is welcome in my kitchen. I also like the look of your tomato couscous and I think I may have to make it for our supper tonight. Thanks. Thanks Janice – it is very distinctive isn’t it. I think we will be having leftover tomato couscous for supper tonight too! What a gorgeous pot! Absolutely love it, but sadly probably a bit out of my price range )o: And tomato couscous is just the perfect dish to cook in it. I love smoked paprika in tomato-ey dishes, gives the idea of being cooked with chorizo but without the meat! Thanks for linking to my Herby Giant Cous Cous! This is a striking pot. I adore these dishes shaped like fruits & begs but He think them tacky. So they are normally sneaked in. Might be a problem with such a stunning piece. Is it heavy?